Relax and unwind with this complete aromatherapy kit. 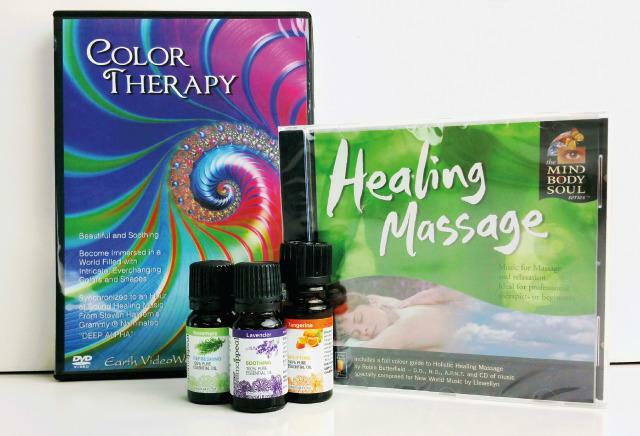 Color Therapy DVD is a collection of over 200 beautifully designed color-rich patterns that move slowly (59 minutes). The Healing Touch CD is music designed to comfort and relax, revitalize and heal, ease tension and stress and also invigorate. The Variety Aromatherapy Kit includes three of the most popular scents in 10-ml bottles: Lavender, Rosemary, and Tangerine.